As the calendar comes ever closer to our 13th Annual Exposed DC Photography Show, we announce our second Best in Show prize winner. Each year, Exposed DC invites a panel of five influential photographers to choose their favorite image, and each winning photographer receives a $100 cash prize from Exposed DC. 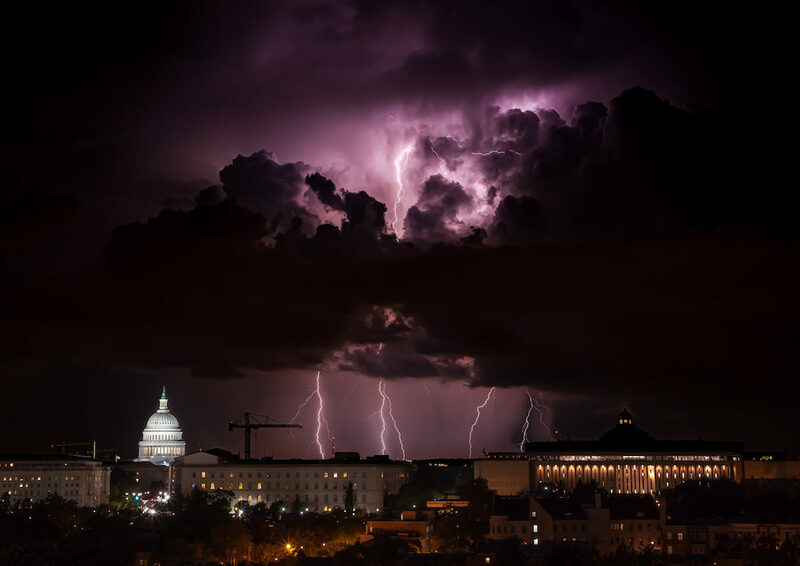 “Electricity on the Hill” by Joe Leavitt was selected by Sam Hurd, who described the image as “powerful in such a turbulent political climate.” He added, “Excellent composition for something as unpredictable as lightning, and timeless post-processing overall.” It’s a truly remarkable image demonstrating the power of nature. Stay tuned as we continue to announce the 2019 Best in Show winners throughout the week, and get your advance tickets to the opening reception now! Sam Hurd started out as a political news and celebrity portrait photographer in Washington, D.C. and was instantly drawn to wedding photography as a space to promote more inventive ideas. Sam’s focus is on photographic techniques that are deceptively simple, but have potential to transform difficult or uninspiring shooting environments into one of a kind opportunities for every photo made.